Suzy Cohen is perhaps the most famous pharmacist that is an advocate for functional medicine or in other words, healing through natural methods. She has been published in many major magazines and featured on the Dr. OZ show multiple times as well as other daytime TV shows. She sells several dietary supplements on her website designed to treat a range of issues. There is a big emphasis on thyroid supplements on her store given the fact that are three different thyroid supplements on her web store: HashiScript, Thyroid Greens, and Thyroid Script. Thyroid Greens seems to be a powder packed with herbs and HashiScript is an iodine free thyroid support supplement for, as the name suggests, those with Hashimoto’s disease. Thyroid Script is the flagship of Cohen’s dietary supplements for the thyroid. It is the most complete one so we decided to look at and review it. Thyroid Script, formerly known as ThyroScript, is a 13 ingredient dietary supplement that Suzy Cohen developed to offer nutritional support for optimal thyroid functionality. 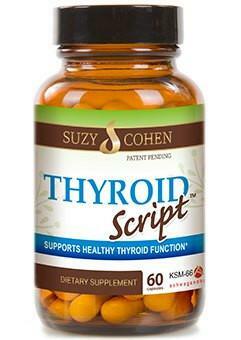 Suzy Cohen states Thyroid Script is GMO free, gluten free, and friendly for vegans. Perhaps the biggest marketing aspect of this supplement, and what Cohen states makes Thyroid Script different from other thyroid supplements, is that it contains DPPIV. DPPIV, or Dipeptidyl Peptidase IV, is an enzyme that some studies have been shown to degrade the harmful effects of consumed gluten that some people experience. As we talked about in our article here regarding the Best (And Worst) Foods To Eat With An Underactive Thyroid, those with gluten sensitiveshave the potential of having higher thyroid disorders. So, I think its great that Thyroid Script included this enzyme as it has the potential of greatly helping those with gluten sensitives. Thyroid Script costs $34.99, and that is without shipping. It seems that shipping will be around an additional $5, so you’re looking at a starting price of $40 for this thyroid supplement. Certainly an expensive thyroid support supplement. Let’s see if its worth the cost. I talked a bit already about the DPPIV that is included in this thyroid supplement, but lets look at the other herbs, minerals, and vitamins in Thyroid Script. 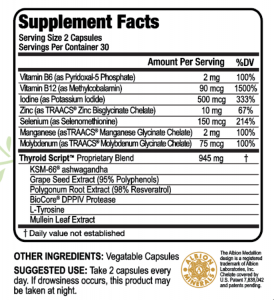 Thyroid Script contains two different forms of vitamin B, iodine, zinc, selenium, manganese, molybdenum, and a proprietary blend of herbs and l-tyrosine. The first aspect of this dietary supplement I noticed, and this is something that everyone should look for in a thyroid support supplement as well, is Iodine and the amount that it contains of this mineral. I have previously written about the importance of Iodine for the thyroid gland. You don’t have to read all 2,000 some words to get the gist: which is that iodine is the most important mineral for healthy thyroid performance. So, it is great to see that Suzy Cohen included Iodine and a decent amount of it into Thyroid Script. Thyroid Script is also unique in that it contains proprietary chelates from Albion. Cohen states it is supposed to be gentler on the stomach. There is however, a significant mineral that I believe is missing in this formula: Copper. Suzy Cohen herself states that Copper is necessary for conversion of T4 thyroid hormone to T3 on the same page where Thyroid Script is displayed, but fails to include it in this formula for whatever reason. I would have liked to see more herbs too, but talking about the importance of copper and then not including it is certainly puzzling. I am also not a big fan of the Thyroid Script Proprietary Blend. I’ve never been a big fan of proprietary blends even though it is something that a lot of the popular thyroid supplements use. I understand the reasons behind it – it allows the company or in this case, Cohen, to hide the exact details of the amount of each ingredient that goes into each capsule so other companies do not steal your formula. However, it also does not allow the consumer to be able to know the exact amounts of each ingredient. If they take another supplement with the same ingredients, it would be helpful to know the amount of each one so you do not over or under dose on a particular herbs, mineral, or vitamin. 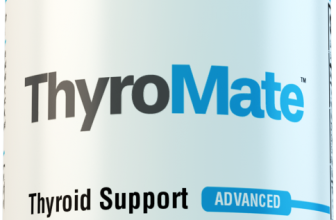 Criticism of Thyroid Script is focused on two aspects of this thyroid support supplement. Firstly, there is some doubt as to whether Thyroid script can be truly effective. Some reviewers have noted that they have feel little to no changes after taking Thyroid Script for some time. Others have said that it made their stomach feel upset. Perhaps these side effects and ineffectiveness for some result from the quality of the sources for the ingredients, which although unique may result in unpleasant effects for some. The inability for the formula to cover most of the bases for thyroid deficiency, such as excluding Copper and other vitamins and minerals, might be another answer. The second focus of criticism is the size of the Thyroid Script’s capsules. While this may not be a problem for some, the capsules in this supplement seem to be unusually large. If you already have some trouble swallowing normal sized capsules, this could be a big problem for you. Alternatively, you may not have this issue but it is something to keep in mind for those with gag reflexes or sensitivities to large sized capsules. With that being said, there are a decent amount of good things to be said about Thyroid Script and it does have the potential of helping those with an under active thyroid. If you think the cost is worth trying Thyroid Script, all the best to you. I’m not sure about it for me though with the amount I’m getting for what it costs.